Hi All, just thought I would let you know that for the first time in eight months I have been able to pull my bow back "Wow"
It has been a long haul and the shoulder is slowly getting better. I have been testing that shoulder almost every week to try and pull the bow back without success, until this morning. So out into the back garden I went with 5 arrows. All arrows were shot, not quite from full draw but close! at 15m the group was dinner plate size, so no cigar! then another 5 arrows the same, but had to stop there. Anyway it is a start and hopefully I can be shooting again in the coming months. The problem was, Bursitis and a torn tendon in the left shoulder and after 2 cortizone injections and half a dozen physio sessions, plus tens machine etc thing are looking better. So, I had to share my excitement with you. Hope to see you all at a shoot soon. Hi Ron know where you are coming from there i have torn tendon and dodgey elbow on the left and partial tear in the right shoulder and tennis elbow in the right side. I have found if i stick to less than 45# and use stretch bands bsfore i shoot and sometimes i sart a session with a 30 - 35# first then go up i seem to shape up all right but i certainly know it if i do too much. Cheers and good luck with it. Good to hear Ronster; just take it easy and build up slowly to shooting again. sorry hear you have been having shoulder troubles but so glad you are on the mend. Clearly, just being able to draw and shoot is an exciting step forward so I hope it continues to go well over coming weeks. 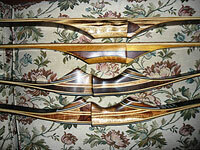 And I hope to see you and Sue at a trad shoot somewhere soon. Here's to a great 2018 for you both. Thanks Guy's, Hope to see you all soon.